the adventures of tartanscot™: "Come Up and See Me Sometime . . . "
I'm pleased to announce that I'll be taking part in an exciting panel discussion examining the uses of social media in the interior design business. 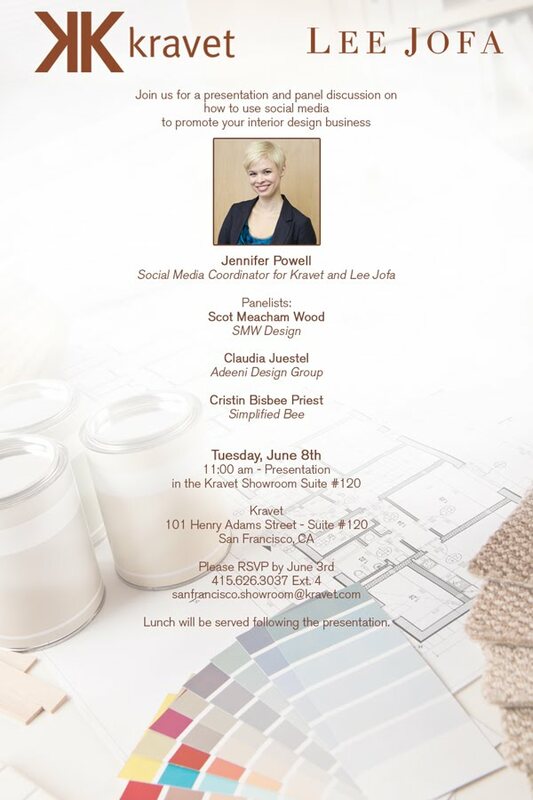 If you're in the area next Tuesday (June 8th) please join us at the newly expanded and redesigned Kravet showroom at 11am for a lively chat with Jennifer Powell (Social Media Coordinator for Kravet and Lee Jofa,) Claudia Juestel (Adeeni Desgin Group,) Cristin Bisbee Priest (Simplified Bee,) and myself. See you Tuesday for the discussion and lunch - and be sure to introduce yourselves - I love meeting my readers . . . I wish I could be there, do let us know the details after!! You too! So much fun. Such a pleasure to share the panel with you and Cristin, and our charming host Jennifer. I learned a lot from you guys, and I look forward to more discussions on the subject.